In this complex world, it is not possible to set one single aim and move towards it in one straight line. Maybe this has never even been possible. Because there are so many decisions to make that distort the line. But it’s especially difficult today where trends, technologies, values, pop culture, and business-making change in an incredible speed. So then emerges for someone, who wants to manage his own career and follow a vision, one factor that will determine whether he will succeed or not. This factor is how he will manage the innumerable difficulties, ambiguities and changes coming from the employees, shareholders, customers and solution partners in this complex geography. Good leaders or management teams are those who can manage the right navigation in chaos; not those who only set the right target. LinkedIn’s CEO Jeff Wiener is a really strong leader. He gave a speech when LinkedIn’s results from the last quarter were below expectations. In this inspiring speech, he said the real job was to deal with these obstacles, and the long-term success of the company was their belief in their own vision. He also added that companies that succeed were those who can manage these periods well. I was glad for the results that made the way for this speech. Bravo! The navigation skill I’m talking about essentially relies on one single factor: The ability to make long-term decisions. 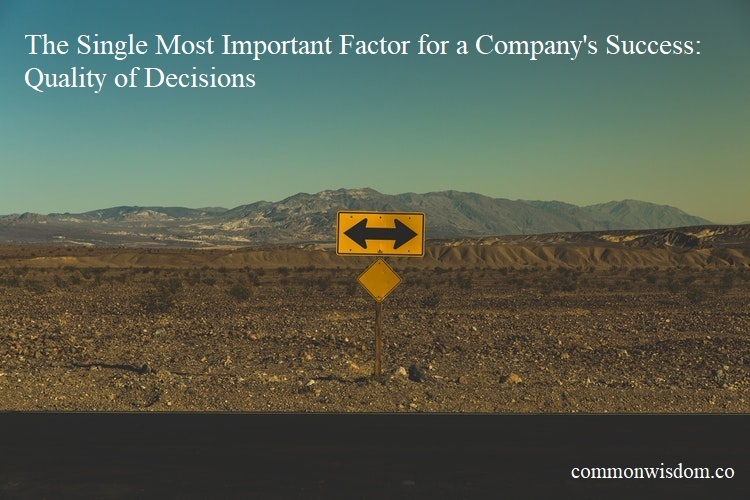 How does the company management make decisions? Consulting to family and friends. Based on successful examples and experiences from the past. Looking at market conditions and fluctuations. Taking example of successful competitors. Consulting to the business partners and management crew. Consulting to technical and academical experts in the industry. Taking scientific and logical truth to be the highest value. You might have noticed that the chances of making quality decisions increase as we go lower in the list. Really, companies that can take decisions based on research and science rather than blind instincts and references from acquaintances can more often take quality decisions that will allow them to surpass hardships in the long term. In spite on this, it is useful to remark that in a realistic scenario; decisions can be made through the combination of many of these points, not with only one. The more a management team or a leader can increase the weight of the points at the end of the list, the more he increases the possibility of being successful in the long term and maintaining that success.